Grand Supreme Bloodcourt, Acid Deathtrip, Izegrim, No Gods No Masters, Throw Me In the Crater - Welcome to the South! This was the third time, this intimate little festival in the south of the Netherlands was been held. Again it proved to be a great festival. Unfortunately there was a lot of local competition of other events and festivals, so it wasn’t too crowded. I missed out on the local opener called Mandatory Suicide. After the local opener is was time for probably the most extreme band on the bill. The Tilburg lot of Throw Me In the Crater pulled off a brutal, heavy show, but unfortunately most part of the crowd didn’t seem to get this band. Also at this point of time, not too many people were in the venue yet, which resulted in a bad and hollow sound. None the less, their filthy, crusty sludge, played on high volume got my mojo running! Underneath that crusty layer, their songs are filled with catchy riffs. Really good intense show. After the heavy filthiness of Throw Me In The Crater, it was time for some more sludginess! No Gods No Masters are a fairly new band out of the east part of the Netherlands. I wasn’t familiar with their stuff, but a good surprise it was. A very solid show, full of groovy and catchy sludge. Off course the influences of Iron Monkey, Eyehategod and even Crowbar are heavily there, but it was played very well and with passion so it’s not an issue. A really solid band, unfortunately their singer seems to have some stage-freight. This makes his performance not really convincing. It seems that he isn’t comfortable on stage. A pity, because when you sound mad and angry, you should do it convincing on stage. None the less a good show! Next up the locals of Acid Deathtrip. Finally for the first time, the sound was good. This resulted in a crushing, heavy rain of thick riffs. Unfortunately the most part of the crowd didn’t seem to care about the bands playing on stage. A pity, because it was a convincing performance with as highlight the Iron Monkey cover ‘Supagorgonizer’. After this cover, they played a new song from the upcoming split LP with Hangman’s Chair and Acid Deathtrip proved once again that they are on top of their game! Even with their faster, catchier songs as ‘This Is How We Roll’, there was almost no response, no applause. Shame, because sound and band were excellent! After that Izegrim was next. I’ve seen this band a couple of times before and it is still a mystery to me, why this band is pretty popular. All I hear is overproduced, triggered lame newschool death-metal with hints of thrash-metal. If you dig triggered, non-original death/thrash, you might want to check it out, I just skipped most of their performance. 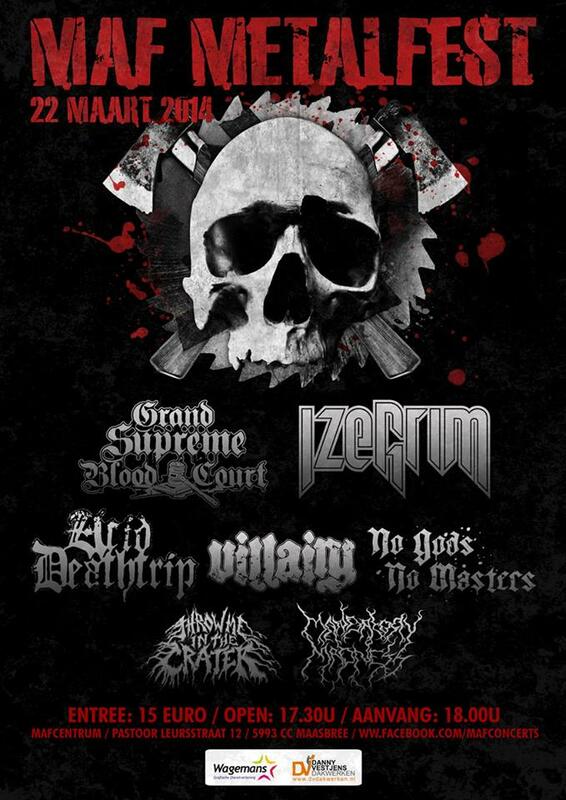 After Izegrim, the primitive oldschool death-metal of Grand Supreme Bloodcourt, was a fresh breath of air in the venue. All of a sudden a lot of people were in front of the stage, so probably a lot of people just waited on Grand Supreme Bloodcourt to play! It seems the line-up changed again within this band, with original Asphyx guitar-player Eric handling the axe again. What followed was a decent oldschool deathmetal show, with the typical vocals of Martin van Drunen. Finally some action happened in front of the stage. After 50 minutes they left the crowd satisfied, with a good show. Looking forward to next year’s edition of this little festival.